CycleDrag.com caught up with newly-appointed AMA/Prostar Drag Race Manager Bruce Sauer for an exclusive interview. Here Sauer discusses how he landed the job, where the series is headed, and the obstacles he now faces. 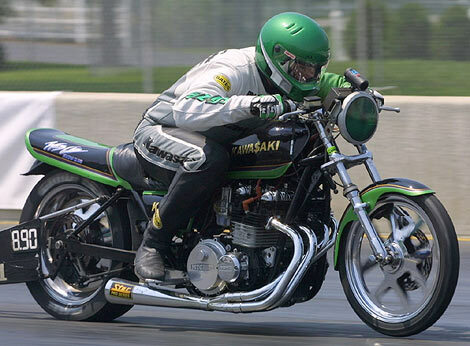 Bruce Sauer started drag racing in 1976 on a Kawasaki KZ 900. Since then Sauer has amassed eight AMA/Prostar championships, 52-national event wins, and nine Sportsman Mechanic of the Year awards. In 2007 instead of battling his many rivals and foes on the racetrack Sauer now faces a complete new set of challenges on the administrative side of the sport with his latest position of AMA/Prostar Drag Race Manager. Cycledrag – Bruce thanks for taking the time to speak with us. First can you explain how all of this came about and what your reaction was when you found out you were being considered for the Drag Race Manager position? Bruce Sauer – Scooter Kizer called me two weeks before the World Finals and asked me if I would be interested in the job. He told me that I had raced the series for such a long time that I knew all of the rules. It really caught me off guard. I never imagined myself in the manager position. I’ve always been a racer. I told him that I would have to talk it over with my wife, Rob Schenz, and a few close friends. The more I talked it over the more I convinced myself that I should give it a shot. I understand how racers think and sometimes the best person to have in charge is a racer, because he’ll be able to understand what everyone needs. Cycledrag – On March 2nd, 2005 your life changed forever. You rolled a Super Comp Dragster at the finish line of Moroso Motorsports Park. In this accident you broke five ribs and severely injured your hand, which put your racing career and professional career as a mechanic on hold. Did this influence your decision to step back from racing? Bruce Sauer – It definitely played a big factor in my decision. My life totally changed after that day. I can’t lift or twist like I used to and I fell behind on my bills. It caused me to look at everything in a different way, and I think that’s what is making it so easy for me to accept this change of going from racer to manager. Cycledrag – So what have you been doing thus far in this newly-appointed position? What are your daily duties? Bruce Sauer – I have been spending a lot of time on the phone talking to contingency, rulebook, and series sponsors. It’s been a lot of time on the phone (laughs). Everything is going great though. I have a desk over at the AMA headquarters and everything. Cycledrag – Who do you have to report to? Bruce Sauer – I report directly to Scooter. He is still in charge and he will continue to be involved. The way I understand it Prostar is going to be the promotional arm for AMA Drag Racing. Cycledrag – There have been some radical changes announced for the 2007 season. Pro Stock, Hot Rod Cruiser, and Super Gas have been cut from the program and the Super Comp index has been readjusted to 9.20. Can you explain what your role was in these decisions and what your opinion of them is? Bruce Sauer – These were Scooter’s decisions and I agree with them. He knew what he wanted to accomplish. Now that I am on the business side of this thing I am really amazed at just how much it cost to run a race and it was obvious that we needed to cut a few classes to keep this thing going. Pro Stock and Hot Rod Cruiser had to go because of lack of participation. All of the top Pro Stock guys will still have a class in the NHRA. Yamaha’s sponsorship of Hot Rod Cruiser expired and because there were only a couple bikes in the class we decided it would be best to eliminate it. And as a bracket racer myself, I think changing the Super Comp index to 9.20 is a great idea. It will make a bigger, better, more competitive class for everyone. It will give everyone who was in Super Gas and the old Super Comp a chance to be in the class. There was one other change proposed to combine Funny Bike and Pro Mod. I’m glad it didn’t happen. I was totally against it and it wouldn’t have worked. Cycledrag – There has been some grumbling by some of the pros who are opposed to the new $250 entry fee. What is your response? Bruce Sauer – That decision was in place before I took over. I will say this though, prices have not increased for the last 11 years. It was time for an increase and as I said before Scooter fully knew that some serious changes would have to be made to keep this thing going, and I agree. I want everybody to be happy, but we also have to do what’s right for the series. Cycledrag – After racing for so many years what would you like to change about the sport? What are your goals for the series? Bruce Sauer – Well, we have already made sure all the purses are guaranteed, and from a racers standpoint that’s a big accomplishment. I’d like to be able to work towards giving racers bonuses when we have a good race. I know how much it means to get an extra fifty dollars or extra crew pass for an upcoming event after you win. It makes you want to keep coming back. I like how we have two ET races a weekend. Now that we have cut a few classes and saved some time I’d like to someday have two Street ET races a weekend as well. These guys and girls are there to race. I’d love to give more track time. Cycledrag – How do you respond to some of the concerns of pro racers who say you are a “sportsman” guy, and won’t be able to relate to the pros? Bruce Sauer – It’s simply not true. I’m going to manage the whole series, not just part of it. The pros have a certain set of rules they have to go by and there is nothing I can change about that. I have a great relationship with several of the pros and I talk to Larry McBride on a regular basis. I know what they need. Larry says the worst thing for him is being delayed all day, and I agree. We need to work on keeping the pros on schedule. I understand what the pros have to go through. I crewed for Mike Coulson’s Funny Bike several times. Last year in Gainesville we changed four motors and put a new valve in between rounds, so I understand how difficult in can be. We’ll work with them. Cycledrag – From a guy that has been in drag racing since 1976, how do you see the sport changing and where is it headed? Bruce Sauer – I have watched it go full circle. Back in the 80s the big draw was Top Fuel Harleys without wheelie bars. Then things changed big time. By the early nineties if you didn’t have a wheelie bar on your bike, you had a tow bike. Now it’s changing again and the street bikes are coming back big time. Cycledrag – And as for Bruce Sauer the racer? Have we really seen the last of you in the leathers? Bruce Sauer – No, not yet. I have one more goal in my career and that is to win the bracket finals and get an invite to Pomona. It’s every bracket racers dream. I’m going to run the bracket series at National Trail Raceway. Note – Sauer finished runner-up in NHRA Division 3 in 2002 and made it as far as the semifinals in 2006. Cycledrag – Well Bruce, thank you very much for sitting on the hot seat and answering our questions. On behalf of everyone at Cycledrag we wish you the same tremendous success you enjoyed as a racer in your new position of AMA/Prostar Drag Race Manager this year. Bruce Sauer – Thanks, a lot. I’m very excited for the season as well. My daughter Andrea will be riding my “ATM Machine” KZ this year. Also I’d like to let everyone know my shop, Power by Sauer, is going full speed ahead and I will be here whenever I’m not working on Prostar.